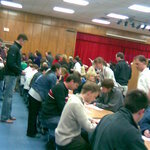 Our Precinct 238 caucus - over 400 people showed up! This is the Obama table; the Clinton table is in the background. 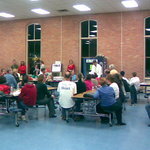 The actual caucus part of the evening - the people standing up are precinct captains. 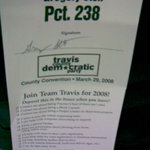 The Travis County Democratic Convention - the line of cars is to get in to park. 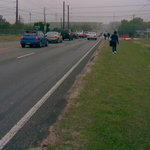 We parked at a nearbyish elementary school and walked. The line system was (unsurprisingly for Democrats :-) ) disorganized. Here's a few of some of the chaos from the front of the line. 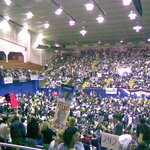 A view of the convention from the floor. Estimated crowd: 7000-8000! My home precinct - 238! 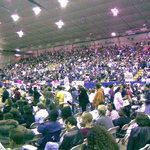 The convention from my seat. The speakers spoke over to the left.